Explosion of Two more Steam-Engine Boilers, attended with Loss of Lives. An original article from the Technical Repository, 1825. Technical Repository; containing Practical Information on subjects connected with Discoveries and Improvements in the Useful Arts. Vol. 7, 1825. 1825. First Edition, Disbound. Very Good Condition. Octavo. 7 pages. Note; this is an original article separated from the volume, not a reprint or copy. Quantity Available: 1. Category: Technical Repository; Inventory No: 155312. Extracts from letters addressed to Professor Silliman, by William Maclure, Esq. President of the American Geological Society. An original article from the Technical Repository, 1826. Technical Repository; containing Practical Information on subjects connected with Discoveries and Improvements in the Useful Arts. Vol. 8, 1826. 1826. First Edition, Disbound. Very Good Condition. Octavo. 7 pages. Note; this is an original article separated from the volume, not a reprint or copy. Quantity Available: 1. Category: Technical Repository; Inventory No: 155499. Furnace for Ventilating Sewers. An original article from the Technical Repository, 1825. Technical Repository; containing Practical Information on subjects connected with Discoveries and Improvements in the Useful Arts. Vol. 7, 1825. 1825. First Edition, Disbound. Very Good Condition. Octavo. 2 pages. Note; this is an original article separated from the volume, not a reprint or copy. Quantity Available: 1. Category: Technical Repository; Inventory No: 155308. Further Information on the Cutting of Hard Steel by Soft Iron. An original article from the Technical Repository, 1822. Technical Repository; containing Practical Information on subjects connected with Discoveries and Improvements in the Useful Arts. Vol. 1, 1822. 1822. First Edition, Disbound. Very Good Condition. Octavo. 3 pages. Note; this is an original article separated from the volume, not a reprint or copy. Quantity Available: 1. Category: Technical Repository; Inventory No: 155233. Further particulars on half-round Boring Bits. An original article from the Technical Repository, 1826. Technical Repository; containing Practical Information on subjects connected with Discoveries and Improvements in the Useful Arts. Vol. 8, 1826. 1826. First Edition, Disbound. Very Good Condition. Octavo. 5 pages + 1 plate, some spotting. Note; this is an original article separated from the volume, not a reprint or copy. Quantity Available: 1. Category: Technical Repository; Inventory No: 155452. Further Particulars of Mr. John Cuthbert's new Reflecting, Compound, and Single Microscope. An original article from the Technical Repository, 1826. Technical Repository; containing Practical Information on subjects connected with Discoveries and Improvements in the Useful Arts. Vol. 8, 1826. 1826. First Edition, Disbound. Very Good Condition. Octavo. 1 page. Note; this is an original article separated from the volume, not a reprint or copy. Quantity Available: 1. Category: Technical Repository; Microscopy. Inventory No: 155491. L. - Guest's Considerations on witholding the Exportation of Cotton-Twist, duty free. An original article from the Technical Repository, 1822. Technical Repository; containing Practical Information on subjects connected with Discoveries and Improvements in the Useful Arts. Vol. 1, 1822. 1822. First Edition, Disbound. Very Good Condition. Octavo. 4 pages. Note; this is an original article separated from the volume, not a reprint or copy. Quantity Available: 1. Category: Technical Repository; Inventory No: 155253. Hints and Queries on cooling Wines and other Liquids during Hot Weather. An original article from the Technical Repository, 1822. Technical Repository; containing Practical Information on subjects connected with Discoveries and Improvements in the Useful Arts. Vol. 1, 1822. 1822. First Edition, Disbound. Very Good Condition. Octavo. 1 page. Note; this is an original article separated from the volume, not a reprint or copy. Quantity Available: 1. Category: Technical Repository; Inventory No: 155183. Improvement in Drawing Iron and Steel Wire. An original article from the Technical Repository, 1825. Technical Repository; containing Practical Information on subjects connected with Discoveries and Improvements in the Useful Arts. Vol. 7, 1825. 1825. First Edition, Disbound. Very Good Condition. Octavo. 2 pages. Note; this is an original article separated from the volume, not a reprint or copy. Quantity Available: 1. Category: Technical Repository; Inventory No: 155339. List of Patents for New Inventions, which have passed the Great Seal, since November 24, 1821. An original article from the Technical Repository, 1822. Technical Repository; containing Practical Information on subjects connected with Discoveries and Improvements in the Useful Arts. Vol. 1, 1822. 1822. First Edition, Disbound. Very Good Condition. Octavo. 2 pages + 1 plate. Note; this is an original article separated from the volume, not a reprint or copy. Quantity Available: 1. Category: Technical Repository; Inventory No: 155109. 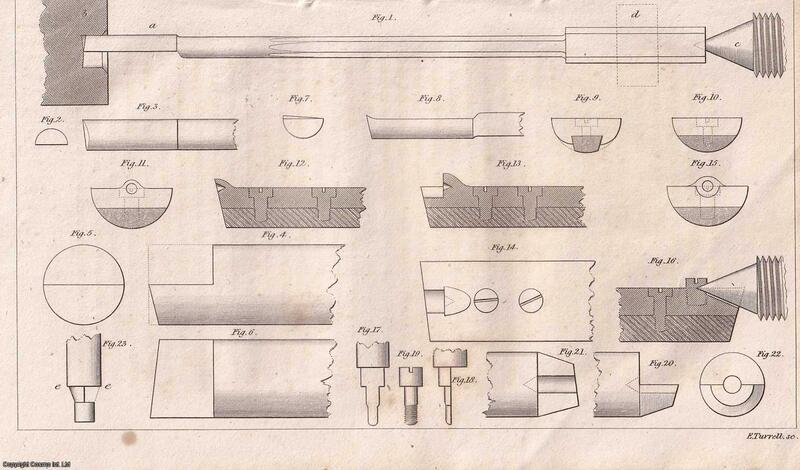 List of Patents for New Inventions, which have passed the Great Seal, since Dec. 22, 1821. An original article from the Technical Repository, 1822. Technical Repository; containing Practical Information on subjects connected with Discoveries and Improvements in the Useful Arts. Vol. 1, 1822. 1822. First Edition, Disbound. Very Good Condition. Octavo. 2 pages + 1 plate. Note; this is an original article separated from the volume, not a reprint or copy. Quantity Available: 1. Category: Technical Repository; Inventory No: 155122. List of Patents for New Inventions, which have passed the Great Seal, since April 16, 1822. An original article from the Technical Repository, 1822. Technical Repository; containing Practical Information on subjects connected with Discoveries and Improvements in the Useful Arts. Vol. 1, 1822. 1822. First Edition, Disbound. Very Good Condition. Octavo. 1 page. Note; this is an original article separated from the volume, not a reprint or copy. Quantity Available: 1. Category: Technical Repository; Inventory No: 155184. List of Patents for New Inventions, which have passed the Great Seal, since May 20, 1824. An original article from the Technical Repository, 1822. Technical Repository; containing Practical Information on subjects connected with Discoveries and Improvements in the Useful Arts. Vol. 1, 1822. 1822. First Edition, Disbound. Very Good Condition. Octavo. 3 pages, some browning. Note; this is an original article separated from the volume, not a reprint or copy. Quantity Available: 1. Category: Technical Repository; Inventory No: 155217. List of Patents for New Inventions, which have passed the Great Seal, since June 22, 1824. An original article from the Technical Repository, 1822. Technical Repository; containing Practical Information on subjects connected with Discoveries and Improvements in the Useful Arts. Vol. 1, 1822. 1822. First Edition, Disbound. Very Good Condition. Octavo. 2 pages. Note; this is an original article separated from the volume, not a reprint or copy. Quantity Available: 1. Category: Technical Repository; Inventory No: 155232. List of Patents for New Inventions, which have passed the Great Seal, since July 27, 1824. An original article from the Technical Repository, 1822. Technical Repository; containing Practical Information on subjects connected with Discoveries and Improvements in the Useful Arts. Vol. 1, 1822. 1822. First Edition, Disbound. Very Good Condition. Octavo. 2 pages. Note; this is an original article separated from the volume, not a reprint or copy. Quantity Available: 1. Category: Technical Repository; Inventory No: 155252. List of Patents for New Inventions, which have passed the Great Seal, since Oct.7, 1824. An original article from the Technical Repository, 1822. Technical Repository; containing Practical Information on subjects connected with Discoveries and Improvements in the Useful Arts. Vol. 1, 1822. 1822. First Edition, Disbound. Very Good Condition. Octavo. 3 pages. Note; this is an original article separated from the volume, not a reprint or copy. Quantity Available: 1. Category: Technical Repository; Inventory No: 155283. List of Patents for New Inventions, which have passed the Great Seal, since Oct.21, 1824. An original article from the Technical Repository, 1822. Technical Repository; containing Practical Information on subjects connected with Discoveries and Improvements in the Useful Arts. Vol. 1, 1822. 1822. First Edition, Disbound. Very Good Condition. Octavo. 3 pages. Note; this is an original article separated from the volume, not a reprint or copy. Quantity Available: 1. Category: Technical Repository; Inventory No: 155295. List of Patents for New Inventions, which have passed the Great Seal since Nov. 23, 1824. An original article from the Technical Repository, 1825. Technical Repository; containing Practical Information on subjects connected with Discoveries and Improvements in the Useful Arts. Vol. 7, 1825. 1825. First Edition, Disbound. Very Good Condition. Octavo. 3 pages. Note; this is an original article separated from the volume, not a reprint or copy. Quantity Available: 1. Category: Technical Repository; Inventory No: 155313. List of Patents for New Inventions, which have passed the Great Seal since Dec. 23, 1824. An original article from the Technical Repository, 1825. Technical Repository; containing Practical Information on subjects connected with Discoveries and Improvements in the Useful Arts. Vol. 7, 1825. 1825. First Edition, Disbound. Very Good Condition. Octavo. 4 pages. Note; this is an original article separated from the volume, not a reprint or copy. Quantity Available: 1. Category: Technical Repository; Inventory No: 155334. List of Patents for New Inventions, which have passed the Great Seal since March. 22, 1825. An original article from the Technical Repository, 1825. Technical Repository; containing Practical Information on subjects connected with Discoveries and Improvements in the Useful Arts. Vol. 7, 1825. 1825. First Edition, Disbound. Very Good Condition. Octavo. 4 pages. Note; this is an original article separated from the volume, not a reprint or copy. Quantity Available: 1. Category: Technical Repository; Inventory No: 155385. List of Patents for New Inventions, which have passed the Great Seal since April, 23, 1825. An original article from the Technical Repository, 1825. Technical Repository; containing Practical Information on subjects connected with Discoveries and Improvements in the Useful Arts. Vol. 7, 1825. 1825. First Edition, Disbound. Very Good Condition. Octavo. 4 pages. Note; this is an original article separated from the volume, not a reprint or copy. Quantity Available: 1. Category: Technical Repository; Inventory No: 155401. List of Patents for New Inventions, which have passed the Great Seal since May 31, 1825. An original article from the Technical Repository, 1826. Technical Repository; containing Practical Information on subjects connected with Discoveries and Improvements in the Useful Arts. Vol. 8, 1826. 1826. First Edition, Disbound. Very Good Condition. Octavo. 4 pages. Note; this is an original article separated from the volume, not a reprint or copy. Quantity Available: 1. Category: Technical Repository; Inventory No: 155414. List of Patents for New Inventions, which have passed the Great Seal since July 26, 1825. An original article from the Technical Repository, 1826. Technical Repository; containing Practical Information on subjects connected with Discoveries and Improvements in the Useful Arts. Vol. 8, 1826. 1826. First Edition, Disbound. Very Good Condition. Octavo. 4 pages. Note; this is an original article separated from the volume, not a reprint or copy. Quantity Available: 1. Category: Technical Repository; Inventory No: 155443. List of Patents for New Inventions, which have passed the Great Seal since Aug. 23, 1825. An original article from the Technical Repository, 1826. Technical Repository; containing Practical Information on subjects connected with Discoveries and Improvements in the Useful Arts. Vol. 8, 1826. 1826. First Edition, Disbound. Very Good Condition. Octavo. 3 pages. Note; this is an original article separated from the volume, not a reprint or copy. Quantity Available: 1. Category: Technical Repository; Inventory No: 155463. List of Patents for New Inventions, which have passed the Great Seal since Sept. 29, 1825. An original article from the Technical Repository, 1826. Technical Repository; containing Practical Information on subjects connected with Discoveries and Improvements in the Useful Arts. Vol. 8, 1826. 1826. First Edition, Disbound. Very Good Condition. Octavo. 2 pages. Note; this is an original article separated from the volume, not a reprint or copy. Quantity Available: 1. Category: Technical Repository; Inventory No: 155482.